I’m baaaack! Yup, that’s right, after a week+ away from blogging, I finally plopped myself in front of the laptop to write about a savory bread pudding. Don’t worry, I didn’t stop cooking, I just haven’t been terribly chatty lately. I guess I’m a bit stressed with life…but hey, that’s a story for another day. 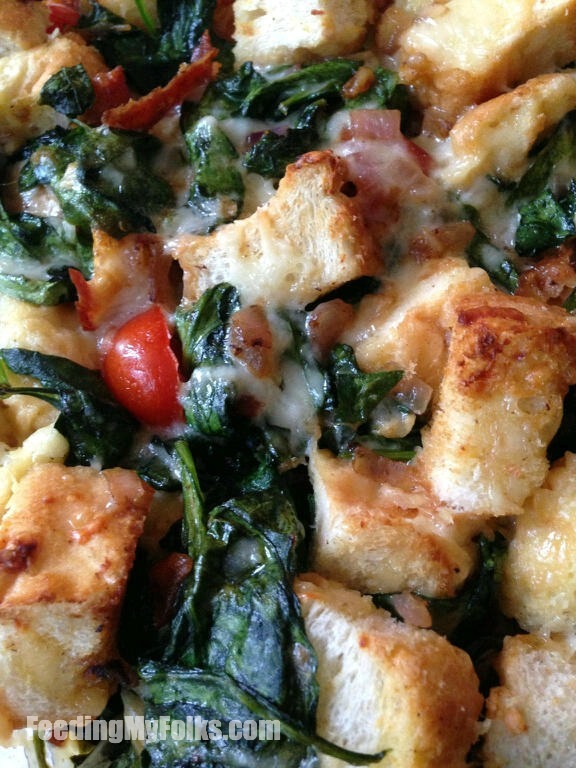 Lets get back to bread, cheese, and bacon-y goodness! Whenever you’re trying to sneak vegetables into your family’s meals, serving them with bread and cheese is the perfect disguise. 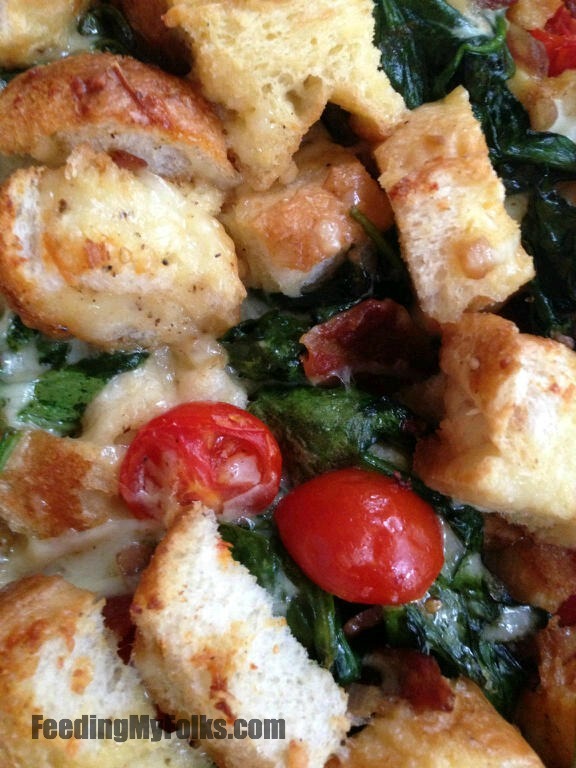 The wilted spinach pairs beautifully with soft, custard soaked bread that’s covered in a gooey gruyère. Scattered throughout the other ingredients are fresh cherry tomatoes that add little bursts of vibrances to the whole dish. Did I forget anything? Oh yeahhhh, the bacon. Salty, crunchy, and indescribably tasty, the bacon gives this bread pudding a savory amazingness that you can’t get from anything else. Before I sign off for the day, let me give you the secret to making a great bread pudding. Use stale, day old bread. You see, when they’re dried out, it’s easier for the custard to soak into all the nooks and crannies while still maintaining some texture (no one wants a blob of mush). If you don’t have any handy, stick the cubed bread in the oven while it’s preheating. The raising heat toasts the bread up perfectly. Cube bread. If fresh, lightly toast in the oven. Put the cubed, toasted bread into a greased casserole dish. Sprinkle the gruyère over the bread. Crisp bacon in a large skillet over medium heat, about 8 minutes. Transfer bacon to some paper towels to absorb the excess oil. In the skillet, add the minced garlic and diced onion. Cook for 2-3 minutes. Add spinach and halved tomatoes with a large pinch of pepper. Stir until wilted. Add in crumbled bacon. Turn off heat. In a medium sized bowl whisk together the milk, heavy cream, and eggs with a pinch of salt/pepper. Pour over the bread/cheese. Add the spinach mixture to the bread. Using your hands, mix everything together. Cover with foil and bake for 30 minutes. Remove foil and bake for 10 minutes more, or until the top browns slightly. I love when you are reading a recipe where you wouldn’t change a thing (which is rare, I always have at least ONE ingredient I want to swap). This looks delicious-can’t wait to try it! Thanks, Andj. Can’t go wrong with bacon, veggies, bread, and melted cheese! Nice! I didn’t know he was in town. 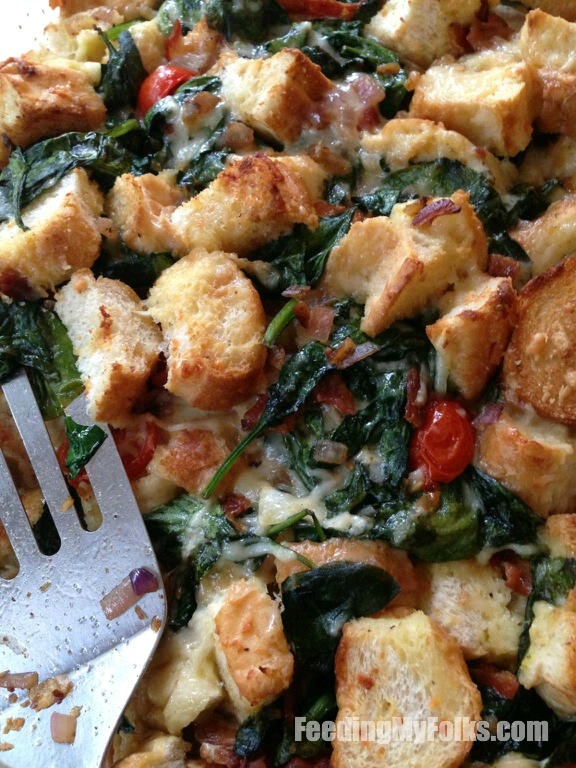 This recipe is kind of a “throw it all in one pan and bake” type of deals. Have a great time and let me know what you two think of it. Gave this a try and it was great. Thanks for posting it!